FKB47 is part of the 2018 Super Treasure Hunt set and 2/10 in the Nightburnerz series. It is a Spectraflame teal race car. “34” and “Porsche” decorate the doors and “TH” is on the rear fenders. 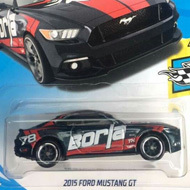 It has tinted windows, a blue interior, white Real Rider Aero wheels, and a gray plastic Malaysia base. 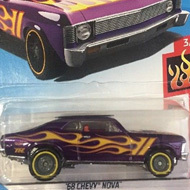 This vehicle can be found in mix “C” of 2018 Hot Wheels mainline cases. The Porsche 934.5 made its debut in the 2017 Factory Fresh series. It is based upon the 1977 racing car that features a 3.0-litre, 590 horsepower turbo engine. Porsche AG only built ten of the 934.5s.